Section on Cellular Signaling, Endocrinology and Reproduction Research Branch, National Institute of Child Health and Human Development, National Institutes of Health, Bethesda, Maryland, USA. Key terms: somatotrophs, lactotrophs, gonadotrophs, GH3 cells, SK channels, BK channels, action potentials, exocytosis. Twenty one years ago in September 1985, I came to the National Institutes of Health as a postdoctoral fellow with ambitions to study biochemical and biophysical properties of pituitary cells. The laboratory of Kevin J. Catt within the National Institute of Child Health and Human Development offered me excellent facilities for the biochemical/molecular biology type of investigations. In a search for collaboration with biophysically oriented laboratory, I asked Greti Aguilera, a Chilean scientist working at that time as a tenured investigator in Endocrinology and Reproduction Research Branch, for advice. She suggested that I approach another Chilean scientist, Eduardo Rojas, who at that time had been working as a principal investigator in the Laboratory of Cell Biology and Genetics, National Institutes of Diabetes, Digestive and Kidney Diseases. Eighteen years later, I still remember the excitement that Eduardo's invitation to start preliminary experiments generated within me. When we met for the first time, he immediately asked me why I wanted to study electrical properties of gonadotrophs and gave me several reprints describing the lack of excitability of these cells and their expression of receptor-controlled and voltage-insensitive calcium channels. Although I was not prepared for this or similar questions, he liked my ad hoc rationale for reexamining the issue. Twenty-four hours later, we started experiments. The first clamped gonadotroph exhibited regular spontaneous electrical activity. The second cell showed periodic single channel activity during continuous stimulation with gonadotropin-releasing hormone, which several years latter we identified as calcium-activated SK-type potassium channels. By the end of the day, it was obvious that we were embarking on a long-lasting and successful collaboration. We were pioneers in characterizing many aspects of calcium signaling and calcium-controlled secretion in pituitary cells, including agonist-induced and inositol (1,4,5)-trisphophate (InsP3)-dependent membrane potential and calcium oscillations in gonadotrophs, the role of calcium as coagonist in control of InsP3-gated calcium channels, the participation of endoplasmic reticulum calcium pump in agonist-induced calcium oscillations, the dependence of agonist-induced calcium oscillations on membrane potential, and the contribution of calcium mobilization and influx in desensitization of voltage-gated calcium channels. During the course of this work, I had a privilege to collaborate with three other brilliant and highly imaginative Chilean scientists working as postdoctoral fellows in Eduardo's laboratory: Andres Stutzin, Manuel Kukuljan, and Leoncio Vergara. My work with Eduardo and his collaborators resulted in the publication of twenty papers in highly prestigious journals. The publication of this volume of Biological Research dedicated to Professor Eduardo Rojas is a special tribute to a gifted person, an extraordinary scientist, a great colleague, a remarkable teacher, and a wonderful friend. During my postdoctoral studies, Eduardo's warmth, enthusiasm, and friendship reinforced my fascination with biomedical research. When my personal life was in disaster, his encouragements to continue work in science were critical. He was always eager to share the excitement of biomedical investigations and to initiate new projects. I was not only fortunate that I had an opportunity to work with Eduardo and his collaborators for ten years, but also to learn about Chile and its great history of electrophysiological investigations. It is a special pleasure to contribute this reminiscence and a review article that also summarizes many of our experiments done in Bethesda. The membrane potential (Vm) of secretory anterior pituitary cells is not stable but oscillates from the baseline potential of about _60 mV (Bonnefont and Mollard, 2003). When Vm oscillations reach the threshold level, pituitary cells fire action potentials (APs). This is a common feature of all secretory anterior pituitary cells. Although the majority of these cells are derived from the same progenitor cells (Ooi et al., 2004), they differ with respect to the pattern of electrical activity and AP-driven calcium signaling and secretion in vivo and in vitro (Stojilkovic and Catt, 1992; Kwiecien and Hammond, 1998; Stojilkovic et al., 2005). Cultured lactotrophs (Fig. 1A) and somatotrophs (Fig. 1B) frequently exhibit larger Vm oscillations, on top of which the depolarizing plateau and bursts of APs are generated, with spikes that usually do not reach the reverse potential (Van Goor et al., 2001a; 2001b). Such complex but organized superimposition of APs is termed plateau bursting activity. In contrast, Vm oscillations in cultured gonadotrophs are small and as yet uncharacterized pacemaker activity generates reverse polarization of Vm and single APs that are sharp short in duration (Kukuljan et al., 1992; Stojilkovic et al., 1992a). Consequently, they are termed single axonal type APs (Fig. 1D). Immortalized GH pituitary cells can exhibit both single AP spikes (Fig. 1C) and the plateau-bursting pattern of firing (Schlegel et al., 1987; Kwiecien et al., 1998; Giraldez et al., 2002). Pituitary gonadotrophs also can generate a plateau-bursting type of electrical activity, but only during the activation of Ca2+-mobilizing receptors (Kukuljan et al., 1992; Stojilkovic et al., 1992a; Tse and Hille, 1992). As shown in Fig. 1E, application of gonadotropin-releasing hormone (GnRH) is associated with marked changes in the electrical activity in single gonadotrophs. These include a transitory cessation of spontaneous AP firing, followed by a complex pattern of Vm oscillations in current-clamped cells. Oscillations occur over a frequency range (5-20/min) that is dependent on agonist concentration. Each cycle of Vm oscillations is initiated by rapid hyperpolarization, followed by slow depolarization that often leads to the firing of multiple APs (Fig. 1F). Such a pattern of electrical activity resembles the plateau-bursting type of Vm activity in spontaneously active somatotrophs and lactotrophs (Fig. 1E vs. A & B). At high nanomolar GnRH concentrations, there is rapid and prolonged hyperpolarization of the plasma membrane, followed by sustained oscillations in Vm (Kukuljan et al., 1992). Figure 1. Patterns of spontaneous (A-D) and receptor-controlled (E and F) electrical activity in pituitary cells. GnRH, gonadotropin-releasing hormone. Vm, membrane potential. In general, APs provide an effective mechanism for promotion of extracellular calcium influx and both the frequency and the shape of APs encode the calcium signal. The differences in the patterns of spontaneous firing of APs among secretory pituitary cells are reflected in the pattern of calcium signaling. In spontaneously active gonadotrophs, the high-amplitude, single APs with a duration of milliseconds cause no obvious changes in the intracellular calcium concentrations ([Ca2+]i) or generate low-amplitude signals ranging from 20 to 70 nM (Fig. 2, right). Such APs generate localized Ca2+ signals, just below the plasma membrane, also known as domain calcium (Li et al., 1995; 1997). Figure 2. Characterization of spontaneous electrical activity and calcium signaling in cultured pituitary cells. Simultaneous measurements of Vm and [Ca2+]i in single somatotrophs, lactotrophs, and gonadotrophs. Asterisks in the upper panel illustrate selected APs and corresponding Ca2+ transients, which are shown in the bottom traces on an extended time-scale. Note the difference in time-scale for gonadotrophs. 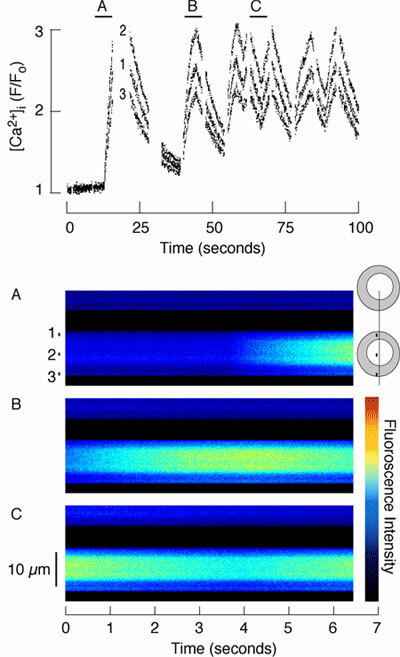 Conversely, somatotrophs and lactotrophs generate slow-resting Vm oscillations with superimposed bursts of APs, with an average duration of seconds and high amplitude that ranges from 0.3 to 1.2 μM (Fig. 2, left & center). The high frequency of single APs in immortalized cells also generates high-amplitude Ca2+ signals (Schlegel et al., 1987). These signals are termed global Ca2+ signals because they reflect increase in [Ca2+]i in all regions of cells. A line scan mode of confocal imaging shown in Fig. 3 illustrates the global nature of Ca2+ signals in a spontaneously firing somatotroph. Since plateau-bursting APs are periodic in nature, this phenomenon results in oscillatory Ca2+ signaling. Figure 3. Line scans of a somatotroph in transition from quiescent to active state. As shown in the schematic representation on the right, fluorescence was recorded along a line that passed through a diameter of one cell and partially through another cell. The line was scanned every 6-7 ms during 6.4 s; the XT image was saved and a new series of scans started. Fluorescence intensities were recorded at two line segments positioned in the cytoplasm (labeled as 1 and 3) and one positioned in the nucleoplasm (labeled as 2). Data are presented as ratios between fluorescence intensity at given time and the average baseline intensity for the corresponding line segments. The chosen images show the initiation of a [Ca2+]i transient (A), a period before and after the peak (B), and a fall and subsequent rise in cytosolic and nuclear [Ca2+] (C). The horizontal lines above the [Ca2+]i profiles indicate the time intervals at which presented XT images were recorded. In some cells, APs generate global Ca2+ signals by triggering the release of Ca2+ from the ryanodine-sensitive intracellular stores. This is not the case with normal pituitary somatotrophs and lactotrophs, in which spontaneous Ca2+ transients depend exclusively on Ca2+ influx through plasma membrane channels (Tomic et al., 1999a; Zimber and Simasko, 2000). Also, spontaneous electrical activity (Iida et al., 1991; Van Goor et al., 2001b) in gonadotrophs and short (10-100 ms) depolarization of cell membrane (Vergara et al., 1995) do not trigger Ca2+ release from intracellular stores. Thus, the rise in [Ca2+]i in spontaneously active pituitary cells exclusively depends on voltage-gated Ca2+ influx (VGCI). At the present time, no conclusive evidence was provided for the coupling of VGCI to Ca2+ release in immortalized pituitary cells. Gonadotrophs can generate global oscillatory Ca2+ signals, but only during activation of Ca2+-mobilizing receptors. In parallel to Vm oscillations (Fig. 4A), application of GnRH in these cells leads to oscillatory changes in current (B) and [Ca2+]i (C). The mean threshold concentration for activation of the base-line oscillatory [Ca2+]i and current responses is about 15 pM for GnRH, and the frequency but not the amplitude of spiking is determined by the agonist concentration (Iida et al., 1991; Stojilkovic et al., 1994; Tomic et al., 1994). The initiation of GnRH-induced Ca2+/current signaling does not require extracellular Ca2+ and is dependent on release of this ion from the endoplasmic reticulum (ER) (Iida et al., 1991). At elevated GnRH concentrations, the early oscillatory response is replaced by a prolonged spike followed by sustained low-amplitude oscillations, termed biphasic response (Tomic et al., 1994). Figure 4. GnRH-induced electrical activity and calcium signaling in gonadotrophs. Activation of GnRH-calcium-mobilizing receptors is associated with baseline Ca2+ oscillations (C) and periodic activation of Ca2+-controlled apamin-sensitive K+ channels (B), which transiently hyperpolarize the membrane (A). When [Ca2+]i is at baseline levels, apamin-sensitive channels are not activated, and gonadotrophs are able to fire one to five APs. Such a pattern of electrical activity resembles the plateau-bursting type of spontaneous firing in somatotrophs and a fraction of lactotrophs. It appears that agonist-induced Ca2+ oscillations are unique for gonadotroph subpopulations of anterior pituitary cells. Activation of Ca2+-mobilizing receptors in somatotrophs leads to a transient increase in [Ca2+]i, hyperpolarization of cell membrane and abolition of firing, followed by a sustained depolarization of the cell membrane and recovery of firing of APs, usually with higher frequency (Tomic et al., 1999b). A similar pattern of Vm and [Ca2+]i responses was observed in lactotrophs (Fig. 5A) and immortalized GH3 cells (Fig. 5B). In contrast to Ca2+-mobilizing TRH receptors, activation of Ca2+ mobilizing endothelin (ET) receptors in somatotrophs (Tomic et al., 1999b) and lactotrophs (Fig. 5B) causes a sustained abolition of electrical activity and associated VGCI. The cross-coupling of ET receptors to pertussis toxin-sensitive Gi/o signaling pathway accounts for prolonged inhibition of electrical activity, which is mediated by activation of inward rectifier K+ channels (Tomic et al., 2002). Thus, ET receptors generate a unique situation among Ca2+-mobilizing receptors expressed in pituitary cells, as their activation leads to simultaneous depletion of intracellular Ca2+ pools and blockade of Ca2+ influx. Figure 5. Effects of Ca2+-mobilizing thyrotropin-releasing hormone (TRH) and endothelin-1 (ET-1) on the pattern of electrical activity in spontaneously active lactotrophs (A&C) and GH3 cell (B). The transient hyperpolarization was abolished by application of apamin, a specific blocker of SK-type K+ channels. Inhibition of SK channels does not change the pattern of actions of TRH and ET-1. In general, K+ channels are key determinants of cellular excitability and are subject to modulation by Ca2+ and other intracellular second messengers. All pituitary cells express slow-inactivating K+ channels at comparable levels, whereas functional expression of the transient K+ channels is much higher in lactotrophs and gonadotrophs than in somatotrophs (Van Goor et al., 2001c). This difference is unlikely to underlie the cell-type-specific firing pattern, because both lactotrophs and somatotrophs exhibit plateau-bursting type of spontaneous electrical activity. The most dramatic differences are related to the expression of Ca2+-activated BK-type K+ channels. The presence of these channels has been shown in immortalized anterior pituitary cells (Ritchie, 1987a; Lang and Ritchie, 1990; Shipston et al., 1996), and native intermediate pituitary cells (Kehl and Wong, 1996). Recent studies indicate that BK channels also are expressed in lactotrophs and somatotrophs and that their activation depends on the status of VGCI (Van Goor et al., 2001c). As shown in Fig. 6, the two-step protocol applied to cells bathed in Ca2+-containing, and subsequently in Ca2+-deficient, medium indicates the presence of high-amplitude, VGCI-sensitive K+ currents in somatotrophs and lactotrophs but not in gonadotrophs. Pharmacological identification of VGCI-activated K+ currents is consistent with expression of the BK subtype of these channels in somatotrophs and lactotrophs. First, the specific BK channel blockers, iberiotoxin and paxilline, markedly reduce the K+ current in these two cell types. Second, the BK channel activator, NS1619, increases K+ current amplitude in somatotrophs and lactotrophs but not in gonadotrophs. Third, unlike the BK channel blockers, the SK channel blocker apamin has no effect on the K+ current elicited by the 100-ms Ca2+-influx step in most of the cells examined (Van Goor et al., 2001c). In general, the co-localization of BK channels with voltage-gated calcium channels (VGCCs) facilitates spike repolarization, which limits AP-driven Ca2+ influx (Miranda et al., 2003; Lin et al., 2004). In immortalized pituitary cells, BK channel activation also can influence the frequency of APs by slowing pacemaker depolarization (Haug et al., 2004). On the bases of these results, it would be expected that the relatively high levels of BK channel expression in somatotrophs and lactotrophs should limit AP-driven Ca2+ influx more than in gonadotrophs, which express very few of these channels. However, this hypothesis is inconsistent with the duration of the AP waveforms in the three cell-types. In addition, both the amplitude and duration of the spontaneous, VGCI-dependent [Ca2+]i transients are greater in somatotrophs and lactotrophs than in gonadotrophs. In somatotrophs with buffered [Ca2+]i, the profile of the AP waveform is shifted from plateau bursting to single spiking. Similar effects also were seen during application of iberiotoxin or paxilline. These, and other results discussed in detail in Van Goor et al. (2001a), indicate that BK channel activation is needed to generate the sustained plateau potential that prolongs AP bursting duration and facilitates extracellular Ca2+ entry in somatotrophs. The plateau-bursting type of electrical activity observed in GnRH-stimulated gonadotrophs also depends on Ca2+-controlled K+ channels, as indicated by the striking similarity in the patterns of [Ca2+]i and current/Vm oscillations. In accordance with this, simultaneous measurement of both parameters in single gonadotrophs showed that the initial rise in [Ca2+]i is accompanied with hyperpolarization of the membrane, and that the subsequent [Ca2+]i oscillations are in phase with the Vm oscillations, such that [Ca2+]i peaks correspond to the hyperpolarized phase of the Vm oscillations (Kukuljan et al., 1992). Apamin, a selective blocker of SK channels, markedly alters the pattern of GnRH-induced current and Vm oscillations and shifts the Vm at the hyperpolarized phase of the oscillations, whereas tetraethylammonium and charybdotoxin are ineffective (Kukuljan et al., 1992; Tse and Hille, 1992). The role of SK channels in generating transient hyperpolarization waves also is established in GnRH-stimulated gonadotrophs from neonatal rats (Zemkova and Vanecek, 2000). Experiments with apamin unmasked an additional low-amplitude oscillatory current, which also is activated by the periodic calcium release from the intracellular stores (Vergara et al., 1997). Further experiments are required to clarify the nature of this current. In contrast to the cell-type-specific expression and coupling of VGCI and BK channel activation, the SK-type of K+ channels in pituitary cells cannot be activated by AP-driven calcium influx. In addition to gonadotrophs, these channels are expressed in other cell types and have a role in agonist-controlled excitability. For example, the hyperpolarization of cells induced by TRH in lactotrophs and GH3 cells is mediated by SK-type K+ channels, whereas the channels responsible for sustained depolarization have not been identified (Sankaranarayanan and Simasko, 1996; Tomic et al., 2003). Together, these findings indicate that SK channels are not active participants in generating oscillatory Ca2+ signals but reflect the status of Ca2+ release from ER. Figure 6. Identification of calcium-activated K+ channels in pituitary cells. Left, Representative K+ current traces in somatotrophs, lactotrophs and gonadotrophs evoked by the two step protocol (top panel) in calcium-containing (control) and -deficient medium (-Ca2+). The two-step protocol consisted of a 100 ms condition pulse to -10 mV to activate voltage-gated Ca2+ influx, followed by a 500-ms test pulse to 90 mV, during which the peak K+ current was monitored. Right, The net Ca2+-activated K+ current activated by the two step protocol was isolated by subtracting the current evoked in the presence and absence of Ca2+. Two lines of evidence indicate that GnRH-induced Ca2+ responses of single gonadotrophs are dependent on increases in InsP3 production. First, agonist-induced Ca2+ oscillations are inhibited by two phospholipase C inhibitors, U73122 and neomycin, in a time- and concentration-dependent manner (Stojilkovic et al., 1994; Zheng et al., 1995). Second, the major patterns of Ca2+ response elicited by intracellular injection of InsP3 are indistinguishable from those induced by GnRH. Each includes a sub-threshold response without oscillations, a threshold-oscillatory response with modulation of spiking frequency by increasing InsP3 concentrations, and a biphasic response with summation of individual spikes into an initial peak followed by a plateau oscillation (Tse and Hille, 1992; Stojilkovic et al., 1993). The mechanism of Ca2+ spiking in pituitary gonadotrophs does not appear to involve fluctuations in InsP3 levels, since cells exposed to its non-hydrolysable analogs show prominent oscillatory responses (Stojilkovic et al., 1993). The finding that the oscillatory nature of Ca2+ release from intracellular pool is mimicked by non-metabolized forms of InsP3 prompted investigations on the other intracellular factors contributing to the periodic opening and closure of InsP3 receptors. Experiments with isolated InsP3 receptors indicated that Ca2+ acts as a modulator and shifts the channel sensitivity to InsP3 along a bell-shaped curve (Bezprozvanny et al., 1991). Theoretical studies suggested that Ca2+, acting as a coagonist with InsP3 in the control of Ca2+ release from ER, is sufficient to generate oscillations (De Young and Keizer, 1992). Such an action of Ca2+ on InsP3-induced Ca2+ release is a key feature in the operation of the ER oscillator, a process described by Lechleiter and Clapham (1992) and Keizer et al. (1995) as intracellular calcium excitability, i.e., ER calcium excitability. In accord with this, changes in [Ca2+]i produced by over-expressing ER Ca2+ pump (Camacho and Lechleiter, 1993) and by stimulation and inhibition of Ca2+ entry through voltage-insensitive (Girard and Clapham, 1993) and voltage-sensitive Ca2+ channels (Kukuljan et al., 1994) were found to modulate the frequency of spiking. In general, de Young and Keizer's model of InsP3-controlled model of Ca2+ oscillations is based on sequential positive and negative effects of this cation on InsP3 receptors and is adequate to accommodate the temporal and spatial nature of agonist-induced intracellular Ca2+ signaling in gonadotrophs. The details of the bidirectional effects of Ca2+ on InsP3 receptor-channels in these cells were provided in elegant experiments by Rojas' group (Vergara et al., 1995). The ability of a membrane depolarization pulse to reset the phase of ER-derived Ca2+ oscillations strongly supports the hypothesis that Ca2+ exerts a stimulatory effect on Ca2+ release from the ER. The time needed to induce such phase resetting ranges between 50 and 100 s. On the other hand, the use of a double-pulse protocol, with variation in the time between depolarization pulses, revealed that gonadotrophs need time to undergo the slow transition after the previous spike before they could again be activated by Ca2+. This time was estimated to be about 1.2 s, which is consistent with the duration of refractoriness of the InsP3 receptor channels (Vergara et al., 1995). Agonist-induced Ca2+ release in other anterior pituitary cells also is dependent on production of InsP3 and subsequent activation of InsP3 receptors. At the present time, however, it is not clear why Ca2+ release in gonadotrophs but not in other pituitary cells types is periodic. We may speculate that the expression of different subtypes of InsP3 receptors among pituitary cells alters the co-agonist action of Ca2+ required for oscillatory nature of Ca2+ release. It also is possible that the intracellular organization of the ER structure differs among the subpopulations of pituitary cells, which in turn may influence the spatial aspect of signaling. The importance of (Ca2+)ATPase in InsP3-induced Ca2+ oscillations was demonstrated in experiments with thapsigargin and 2,5-di-(tert-butyl)-1,4-benzohydroquinone, which act as specific blockers of the ER Ca2+ pump (Iida et al., 1991; Stojilkovic et al., 1994; Tse et al., 1994a). The application of these blockers in oscillatory cells leads to the cessation of Ca2+ spiking. The sustained and extracellular Ca2+-dependent Ca2+ and Vm oscillations also are abolished by application of thapsigargin (Stojilkovic et al., 1992a; Kukuljan et al., 1994). These effects are consistent with the view that the ER Ca2+ pump is an integral element of the InsP3 and Ca2+-controlled oscillatory response; (Ca2+)ATPase overcomes the negative effect of [Ca2+]i on its own release by pumping the ion into the ER and thereby favoring re-initiation of the Ca2+ response (Keizer et al., 1995). Thus, during GnRH stimulation, the intracellular Ca2+ pools discharge their ion contents into the cytoplasm and subsequently re-accumulate Ca2+ from that source, including Ca2+ entering through VGCCs. Among the secretory anterior pituitary cells, the role of mitochondria in Ca2+ signaling was studied only in agonist-stimulated gonadotrophs. Initially, it was suggested that GnRH-stimulated gonadotrophs operate as "closed" cells (i.e., with no extrusion of calcium) and that the re-uptake and release of Ca2+ from mitochondria participates in intracellular calcium homeostasis (Tse et al., 1994b). In further studies using Ca2+ green-1 and rhod-2 as optical measures of cytoplasmic and mitochondrial free Ca2+, the same group showed that mitochondria sequester Ca2+ and tune the frequency of Ca2+ oscillations but, in contrast to the blockade of ER Ca2+ pump, do not abolished oscillatory response. Hille's group also showed that mitochondria lower the localized Ca2+ near sites that trigger exocytosis (Kaftan et al., 2000). Consistent with the participation of mitochondria in Ca2+ homeostasis, during repetitive GnRH stimulation of short duration, removal of Ca2+ had only a minor effect on baseline oscillations but abolished spike response, whereas removal of Na+ slightly extended duration of baseline oscillations and considerably prolonged spike responses (Zemkova et al., 2004). Taken together, these results indicate that two Ca2+ handling mechanisms are operative in gonadotrophs: redistribution of Ca2+ within ER and mitochondrial pools and a Na+-dependent Ca2+ efflux followed by Ca2+ influx. Redistribution of Ca2+ within the cell leads to a rapid recovery of InsP3-dependent pool, whereas the Na+-dependent Ca2+ efflux pathway is activated by spike response and limits the time of exposure to elevated [Ca2+]i. Redistribution of Ca2+ between ER and mitochondria does not protect the depletion of intracellular Ca2+ pools during sustained oscillations. Both GnRH- and InsP3-induced current oscillations are extinguished by hyperpolarization after 10-15 min despite the availability of Ca2+ in the extracellular medium (Stojilkovic et al., 1992a). In such treated cells, application of short, depolarizing pulses transiently restores the dihydropyridine-sensitive and extracellular Ca2+-dependent current oscillations, clearly indicating the relevance of VGCI in sustained Ca2+ signaling (Kukuljan et al., 1994). Such responses to depolarization show a marked dependence on Vm with a midpoint of -15 mV and sensitivity to dihydropyridines, consistent with the involvement of L-type VGCCs in the function of the ER oscillator. Furthermore, reduction of extracellular Ca2+ by EGTA and blockade of VGCCs abolishes both [Ca2+]i and sustained Vm oscillations in GnRH-stimulated gonadotrophs (Kukuljan et al., 1997). Finally, repetitive application of brief, depolarizing pulses modulates the frequency of agonist- and InsP3-induced spiking. Depolarizing pulses applied at frequencies lower than the intrinsic rate of episodic Ca2+ release trigger large transients between the autonomous spikes, while higher frequencies of depolarizing pulses overcame the original Ca2+ spiking frequency (Kukuljan et al., 1994; 1997). These findings indicate that VGCI facilitates its liberation from intracellular stores by a direct and instantaneous action on the release mechanism. It also sustains spiking, but does not protect the gradual depletion of intracellular Ca2+ stores during sustained receptor activation. However, VGCI is critical for refilling of the ER Ca2+ stores after washout of agonist (Li et al., 1997). Calcium is the primary intracellular signaling molecule controlling the fusion of secretory vesicles with the plasma membrane to release transmitters from neurons and hormones from endocrine cells (Martin, 2003). This process is termed regulated exocytosis, and is mediated by complex protein machinery that is conserved in organisms ranging from yeast to mammals. These proteins participate in docking, ATP-dependent priming, and fusion of vesicle membranes through interactions that are still not fully characterized (Rettig and Neher, 2002; An and Almers, 2004; Di Paolo et al., 2004). In regulated exocytosis, an increase in [Ca2+]i is required for two steps: priming the secretory vesicles, which occurs on the time-scale of tens of seconds, and triggering the fusion, which occurs within 1-2 s (Martin, 2003). The priming process requires 10 to 40 seconds. Excitable cells secrete in a regulated manner through AP-driven Ca2+ influx and Ca2+-dependent exocytosis. The strength of Ca2+ secretion coupling depends on the pattern of Ca2+ signals and cell types, i.e., there are some differences in molecular mechanisms underlying exocytosis and recapture of synaptic and secretory vesicles (Tsuboi et al., 2004). At synapses, the domain Ca2+ triggered by a single AP is sufficient to activate secretion of vesicles because the predocked release-ready vesicles are linked molecularly to Ca2+ channels localized in active zones, which facilitates their rapid release in response to single APs (Rettig and Neher, 2002). Conversely, the distance between secretory vesicles and Ca2+ channels in pituitary cells is large and domain Ca2+ cannot reach the secretory vesicles. For example, in rat melanotrophs, a short depolarization evokes only a minor degree of secretion (Mansvelder and Kits, 1998). Basal electrical activity (Van Goor et al., 2001b) and short depolarization steps in single gonadotrophs (Tse et al., 1997) also are insufficient to stimulate exocytosis, in contrast to the action of high-amplitude, agonist-induced Ca2+ oscillations (Tse et al., 1993), indicating that in this cell type, global Ca2+ signals are required to trigger secretion. Consistent with these findings, basal (in the absence of agonists, also termed intrinsic or spontaneous) prolactin (PRL) and growth hormone (GH) secretion is high and occurs in an extracellular Ca2+-dependent manner (Ben-Jonathan and Hnasko, 2001). The relationship between the pattern of spontaneous Ca2+ signaling and basal hormone secretion is illustrated in Fig. 7. Basal GH and PRL release is high and is abolished by removal of extracellular Ca2+, a treatment that also abolishes spontaneous electrical activity and high-amplitude Ca2+ transients. In contrast, basal gonadotropin release is low, at the level of detection by radioimmunoassay, and is not affected by blockade of electrical activity and VGCI (Van Goor et al., 2001b), confirming that the global but not the domain Ca2+ signals in spontaneously firing pituitary cells are able to trigger secretion. Figure 7. Extracellular calcium dependence of spontaneous electrical activity, calcium signaling, and basal PRL release. A, Effects of removal of extracellular Ca2+ on spontaneous Vm oscillations and [Ca2+]i transients. B, Effects of removal of extracellular Ca2+ on basal GH (left panel), PRL (central panel), and gonadotropin (right panel) release. In general, differences in the expression levels of ionic channels should underlie the cell-type specific patterns of APs, VGCI, and hormone secretion. Earlier studies provided evidence that pituitary cells express numerous plasma membrane channels, including tetrodotoxin (TTX)-sensitive Na+ channels, VGCCs, transient and delayed rectifying K+ channels, and multiple Ca2+-sensitive K+ channel subtypes (Ritchie, 1987b; Mason and Rawlings, 1988; Korn et al., 1991; Kukuljan et al., 1992; Mollard et al., 1994; Sankaranarayanan and Simasko, 1996; Kwiecien and Hammond, 1998). There are some quantitative differences in the level of expression of TTX-sensitive channels among anterior pituitary cells; under identical culture and recording conditions, lactotrophs and somatotrophs exhibit lower expression levels of TTX-sensitive Na+ channels than do gonadotrophs. These channels are not critical for firing of APs and hormone secretion, as indicated by the lack of effects of TTX on patterns of spontaneous electrical activity and basal hormone release in lactotrophs and somatotrophs (Van Goor et al., 2001b). In gonadotrophs, TTX also does not influence spontaneous firing of APs, but in GnRH-stimulated cells these channels are responsible for re-initiation of firing during the hyperpolarized phase. Both inactivating and non-inactivating VGCCs are found in rat gonadotrophs (Stutzin et al., 1989; Tse and Hille, 1993), somatotrophs and lactotrophs (Lewis et al., 1988), as well as immortalized pituitary cells (Dubinsky and Oxford, 1984; Simasko et al., 1988; Kwiecien et al., 1998). The inactivating Ca2+ current is mediated by the low-voltage activated or transient (T)-type VGCCs, and the non-inactivating Ca2+ channels is mediated by dihydropyridine-sensitive (L-type) and dihydropyridine-insensitive, high-voltage activated VGCCs (Stutzin et al., 1989; Tse and Hille, 1993; Kwiecien et al., 1998). Comparative studies with three cell types indicate that T-type current is more prominent in somatotrophs than in lactotrophs and gonadotrophs (Van Goor et al., 2001c). In spontaneously active somatotrophs, these channels contribute to the pacemaking activity (Tomic et al., 1999a). They also may play a pacemaking role in gonadotrophs (Li et al., 1995). L-type VGCCs are expressed in all secretory anterior pituitary cells. The current-voltage relationship of L-type current in all three cell-types is similar, but the current density is higher in somatotrophs and gonadotrophs than in lactotrophs. The critical importance of these channels in spontaneous electrical activity and basal GH and PRL release is illustrated in experiments with pituitary cells during transient blockade of these channels with nifedipine and Cd2+ (Van Goor et al., 2001b). In gonadotrophs, these channels undergo Ca2+-dependent inactivation; both VGCI (Stojilkovic et al., 1990a) and receptor-controlled Ca2+ release from intracellular stores (Stojilkovic et al., 1989) participate in desensitization of L-type channels. The pattern of electrical activity (plateau bursting vs. single spiking) rather than the level of expression of VGCCs is the major factor determining cell-type specific pattern of secretion. As shown in Fig. 8, the peak amplitude in [Ca2+]i increases progressively with lengthening duration of the depolarizing Vm steps in all three cell-types. Furthermore, gonadotrophs, lactotrophs, and somatotrophs exhibit comparable [Ca2+]i and secretory responses during steady-state depolarization of cells with 50 mM K+, indicating that the secretory vesicles in gonadotrophs also respond to high-amplitude VGCI signals. Finally, a shift in the firing pattern of gonadotrophs from single-spiking to plateau-bursting AP induced by Bay K 8644, an L-type Ca2+ channel activator, is sufficient to trigger gonadotropin secretion when accompanied by increased frequency of firing (Van Goor et al., 2001b). It is possible that an increase in the frequency of firing, without changing the pattern of APs, also would be sufficient to generate global Ca2+ signals and trigger secretion, but this relation has not yet been studied in gonadotrophs. Figure 8. Depolarization-induced rise in [Ca2+]i in pituitary cells. A, Cells were clamped at -90 mV and transiently (25 ms to 2 s) depolarized to 10 mV. B-D, Typical profiles of [Ca2+]i responses to depolarizing pulses of variable duration in somatotrophs (B), lactotrophs (C), and gonadotrophs (D). Several lines of evidence also indicate that an extracellular nucleotide-controlled signaling system is expressed and operative in anterior pituitary cells and may participate in control of pacemaking activity and basal hormone secretion. First, ATP is co-stored with hormones in secretory vesicles and co-secreted by anterior pituitary cells (Chen et al., 1995; Tomic et al., 1996; He et al., 2005). Second, ATP-gated P2X receptor-channels are expressed in these cells (Stojilkovic and Koshimizu, 2001; Rees et al., 2003). To date, seven functional ATP-gated P2X receptor-channels (P2X1 to P2X7) have been identified in mammals (North, 2002). Molecular cloning and functional characterization of rat P2X channels in the pituitary revealed the expression of several subtypes. Initially, the mRNA messages for P2X2a receptors and its spliced form, P2X2b, were identified in pituitary cells (Brake et al., 1994; Koshimizu et al., 1998a; Koshimizu et al., 1998b). Further investigations revealed the expression of mRNA transcripts for P2X3, P2X4 and P2X7 receptors in these cells (Koshimizu et al., 2000). Functional P2X4 receptors are expressed in lactotrophs and contribute to ATP-induced PRL release (He et al., 2003), whereas P2X2 receptors play a major role in control of gonadotropin release (Tomic et al., 1996; Zemkova et al., 2006). As shown in Fig. 9, in identified gonadotrophs ATP induced an inward depolarizing current of about 50 pA, which was accompanied with a significant increase in [Ca2+]i. In this particular experiment, the role of VGCI was excluded by clamping the cell to -90 mV (Tomic et al., 1996). The autocrine/paracrine actions of ATP are controlled by ectonucleotidases, a family of enzymes that also are expressed in pituitary cells (Tomic et al., 1996; He et al., 2005). These enzymes degrade extracellular ATP in a sequential manner to adenosine (Zimmermann, 2000). Figure 9. Identification of ATP-gated calcium-conducting P2X channels in gonadotrophs - simultaneous Vm and [Ca2+ ]i measurements. In a patch-clamped gonadotroph identified by prior treatment with GnRH, ATP induced an inward depolarizing current and rise in [Ca2+]i. The participation of VGCI was excluded by clamping the cell at -90 mV. The intracellular messenger cascades involving G proteins (Cabrera-Vera et al., 2003) have prominent effects on secretion, predominantly by modulating VGCI and Ca2+ mobilization (Stojilkovic and Catt, 1995; Ashworth and Hinkle, 1996; Bluet-Pajot et al., 1998; Freeman et al., 2000; Ben-Jonathan and Hnasko, 2001). Consistent with the pattern of spontaneous GH and PRL secretion, in vivo lactotrophs and somatotrophs are under tonic-negative hypothalamic control by Gi/o-coupled dopamine and somatostatin receptors. These receptors inhibit spontaneous electrical activity and VGCI (Mayo et al., 1995; Freeman et al., 2000; Ben-Jonathan and Hnasko, 2001; Sun et al., 2003). Conversely, the physiological control of gonadotropin secretion from the anterior pituitary gland depends on the pulsatile delivery of GnRH from the hypothalamus (Krsmanovic et al., 1996). Hille's group observed periodic exocytosis in GnRH-stimulated single gonadotrophs (Tse et al., 1993). In their experiments, simultaneous measurements of [Ca2+]i and exocytosis showed that each Ca2+ spike induces a burst of exocytosis. These phenomena were suppressed in cells by buffering intracellular Ca2+ but persisted in the absence of extracellular Ca2+. In an additional study, the authors showed that strong exocytosis requires high [Ca2+]i, with half maximal concentration of 16 μM. For early exocytosis, InsP3-dependent Ca2+ release is sufficient to fully mimic the action of GnRH, suggesting that other messengers are not required (Tse et al., 1997). The intracellular messengers triggered by G-protein-coupled receptors, including cAMP/protein kinase A (Sakaba and Neher, 2003; Nagy et al., 2004), diacylglycerol/protein kinase C (Gillis et al., 1996; Yang et al., 2002), and PIP2/PI3-kinase (Di Paolo et al., 2004; Grishanin et al., 2004), also can influence Ca2+-triggered secretion by regulating the size of the releasable secretory pool and the rate of exocytosis. Furthermore, it has been suggested that G proteins may inhibit synaptic transmission in neuromuscular junction downstream of Ca2+ entry mechanisms (Silinsky, 1984; Silinsky and Solsona, 1992), presumably through Gβγ subunits and their binding partners, syntaxin 1B and SNAP25B (Blackmer et al., 2001). Our results also indicate a close temporal correlation between changes in [Ca2+]i and gonadotropin release during early and sustained GnRH actions (Stojilkovic et al., 1992b). However, the sensitivity of exocytotic machinery to Ca2+ is significantly higher during sustained agonist stimulation, suggesting that other messengers participate in control of exocytosis (Stojilkovic et al., 1990b). We have identified protein kinase C as a potential messenger in the sensitization of secretory vesicles to [Ca2+]i (Stojilkovic et al., 1988a; 1988b; 1991), and this has been confirmed recently in experiments with single gonadotrophs (Zhu et al., 2002). Other messengers also participate in the control of exocytosis in pituitary cells. Recently, we showed that the coupling of receptors to Gi/o proteins, and the subsequent silencing of pacemaker activity through activation of inwardly rectifying K+ channels and inhibition of VGCCs, are not sufficient to account for inhibition of secretion by this particular pathway (Andric et al., 2005). Two lines of evidence support this conclusion. First, ET inhibits basal PRL secretion in picomolar concentrations, which do not affect spontaneous VGCI. Second, in cells with blocked Gi/o coupling, ET inhibits secretion, but not VGCI. The same study also showed that the heterotrimeric Gz proteins provide a pathway through which ET receptors can stop secretion for a prolonged period of time without preventing pacemaking activity and VGCI-controlled cellular functions. These results are consistent with the participation of both arms of Gz proteins, α and βγ, in an ET-induced inhibition of PRL release downstream of VGCI. The Gzα-mediated attenuation of adenylyl cyclase activity in pituitary cells may account for the sustained inhibition of PRL release during ET application and the slow recovery of secretion after agonist removal. In accordance with this, it has been shown recently that the protein kinase A-dependent phosphorylation of SNAP25 increases the size of slowly and rapidly releasable secretory vesicle pools without affecting the kinetics of vesicle fusion (Sakaba and Neher, 2003; Nagy et al., 2004). Thus, the Gzα-mediated inhibition of adenylyl cyclase in lactotrophs could lead to depletion of the primed secretory vesicle pool. On the other hand, the rapid decrease in PRL release induced by ET at basal and elevated cAMP levels is consistent with findings in other cell types about the role of Gbg subunits in control of secretion, independently of their actions on adenylyl cyclase, phospholipase C-β2, and several tyrosine kinases (Blackmer et al., 2005; Gerachshenko et al., 2005). Further studies are required to clarify the potential role of this pathway in somatostatin and dopamine-controlled hormone release. Basal release of hormones from pituitary lactotrophs and somatotrophs was identified over thirty years ago, but the molecular mechanisms underlying this secretion remained largely uncharacterized. More recent studies have shown that electrical activity, and the associated extracellular Ca2+-dependent exocytosis, underlie the intrinsic secretory activity of these cells. However, excitability per se is not sufficient for effective excitation-secretion coupling as documented in spontaneously firing gonadotrophs. Extensive Ca2+ imaging studies and simultaneous electrophysiological and Ca2+ measurements revealed that AP-driven Ca2+ influx generated global high-amplitude Ca2+ transients in somatotrophs and lactotrophs but only domain, low-amplitude Ca2+ signals in gonadotrophs. However, activation of Ca2+-mobilizing GnRH-receptors in these cells leads to generation of periodic Ca2+ oscillations of similar amplitude to those observed in spontaneously active somatotrophs and lactotrophs. Spontaneous VGCI in somatotrophs and lactotrophs is not coupled to Ca2+ release from intracellular stores, whereas GnRH-induced Ca2+ oscillations are dependent on Ca2+ mobilization from InsP3-sensitive Ca2+ stores. In somatotrophs and lactotrophs, BK channels appear to have a role in the formation of plateau-bursting electrical activity. Conversely, pituitary gonadotrophs express relatively few BK channels and spontaneously fire single spikes with a low capacity to promote Ca2+ entry. However, gonadotrophs express SK channels, which are less sensitive to Vm and activation of which does not depend on VGCI but are coupled to agonist-induced Ca2+ release from intracellular stores. This provides for periodic firing of APs of higher frequency and VGCI, which sustains agonist-induced Ca2+ release and hormone secretion. Ligand-gated P2X receptor-channels conduct Ca2+, but also facilitate electrical activity, and this dual action increases the basal rate of exocytosis. Finally, exocytosis is not exclusively dependent on the pattern of Ca2+ signaling, but also on other intracellular messengers, including protein kinase C, protein kinase A, and Gβγ subunits. G-protein coupled receptors modulate basal hormone secretion, not only by changing the pattern of VGCI and Ca2+ release from ER, but also by acting directly on the secretory pathway. This research was supported by the Intramural Research Program of the National Institute of Child Health and Human Development, NIH.